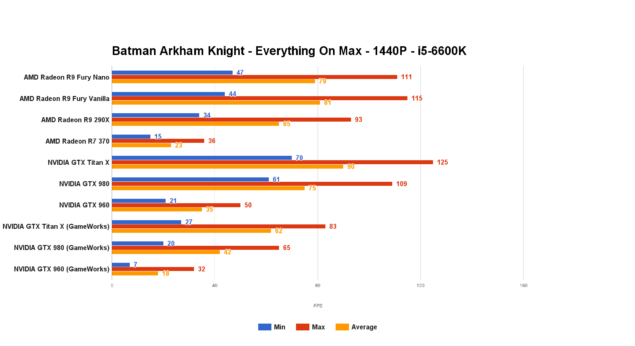 Exclusive: Batman Arkham Knight PC Performance Analysis, is it Finally Fixed? 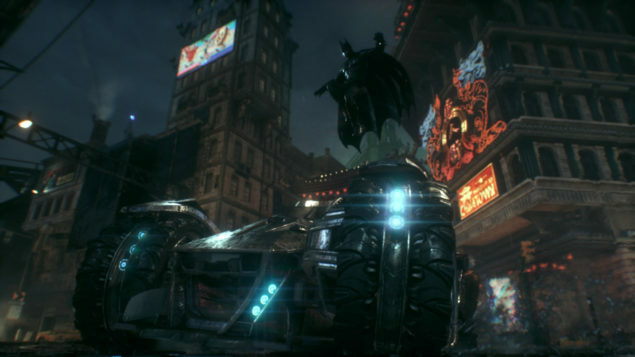 Batman Arkham Knight has be re-released on the PC once again after having been pulled from all sales platforms due to performance issues that had been reported a large number of users. PC sales were suspended until it was finally brought back by WB Games and Rocksteady Studios, who were confident it would be well received, though this re-release was also met with some skepticism and even angst as it also didn’t quite run as smooth as some expected. So today we’ll take a deep dive into the performance of Batman Arkham knight to see how it does from a pure performance standpoint. Crucially some of the issues and concerns surrounding even the re-release of the game aren’t necessarily performance related, but are instead other small, or large, bugs and glitches that tend to crash the game or simply make it unplayable. One of the major issues that hasn’t yet been addressed is that of multi-GPU support, one which might further increase performance for those that have the means and are able. Batman Arkham Knight might just perform a little better now. But is it enough? But those aside, we’ll strive to show you how it performs on two different systems with a variety of GPU’s to see if it’s improved or is even smoother than it had been in the past. The only issue is that I didn’t own it before the re-release, so I cannot compare my results to my own, but instead offer these as a point of reference for your own metrics. GameWorks is seen as being the primary reason that performance has suffered on NVIDIA cards, and is even sometimes the focus for complaints surrounding other issues of stability as well. Whether the integration of GameWorks has been troublesome for Rokcsteady or if it’s been the sole cause of the headaches that they’ve no-doubt felt as they’ve struggled to bring this beast into performance parity with other modern games. And of course a big thank you goes out to ASRock for lending us a Z170 Extreme 4 motherboard for our test bench. Testing was done at two resolutions, 1440P and 1080P, and with the settings recorded in the screenshots below. For GameWorks results, everything was turned on for all NVIDIA cards at both resolutions. 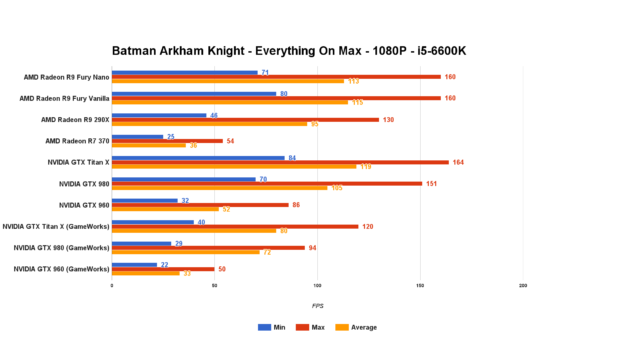 The in-game benchmark was used and compared against FRAPS for accuracy and exported into Google Docs, hence slight change in format over the usual charts. Enhanced Rain and Light Shafts have been turned off for the main test for all cards so as to have parity. But we’ll examine what effect that those two settings have on a vanilla Fury and a Titan X later in the article. 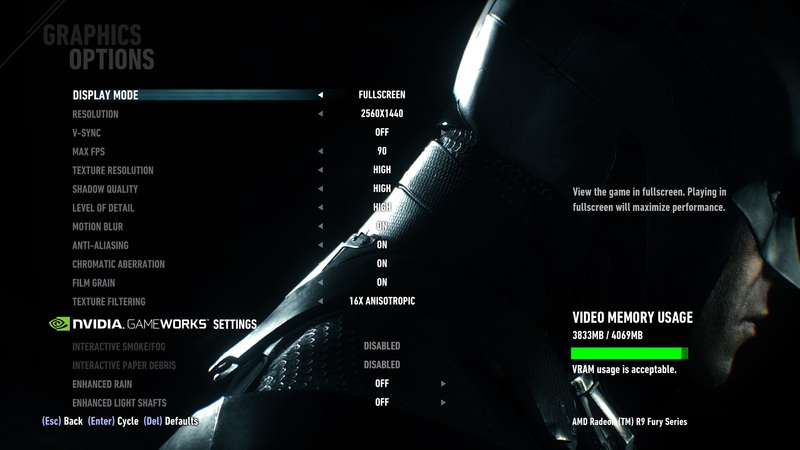 Finally, let’s take a look how Batman Arkham Knight does with the newest patch. Performance of Batman Arkham Knight seems to be fairly good here. It runs rather fast without GameWorks enabled, exceptionally fast in fact. Though NVIDIA clearly has a a performance advantage, neither companies cards provide a poor overall experience, though the low-end are obviously not well suited to such a resolution. GameWorks does have quite the hit in performance, but this is because the rendering, or even compute, overhead is a little higher than without it enabled due to the different effects that can be applied. Batman Arkham Knight actually make use of the compute queue on NVIDIA cards asynchronously with GameWorks enabled, meaning that some of those effects make use of CUDA. In GameWorks, asynchronous compute isn’t used to speed up performance per-se, but instead to be able to increase the level of fidelity with a reasonable performance hit. This method is likely the source of the relatively large drop in performance. Asynchronous compute isn’t explicitely supported by DX11, though, so NVIDIA has to enable context switching within the driver itself. Regardless, using CUDA with DX11 asynchronously isn’t the most efficient operation, as we can see. 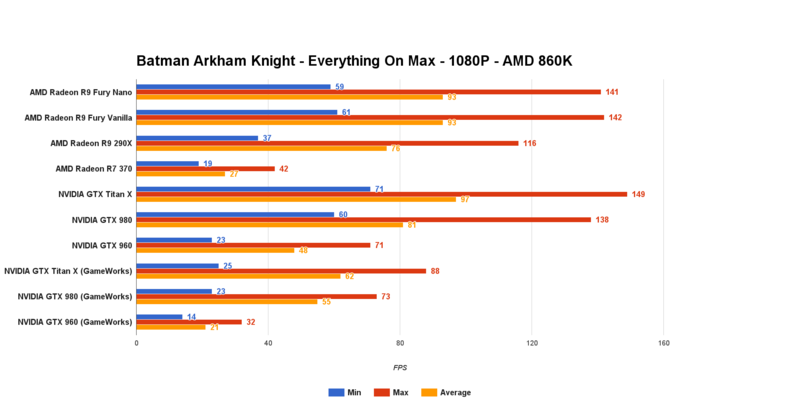 1080P offers a similar if slightly higher framerate for both processors. The i5 is clearly far less limited in its resources and the IPC advantages are fairly clear. GameWorks here seems to primarily be using the compute queue, so the performance difference with both CPU’s is similar. The overall performance is still quite decent, considering. 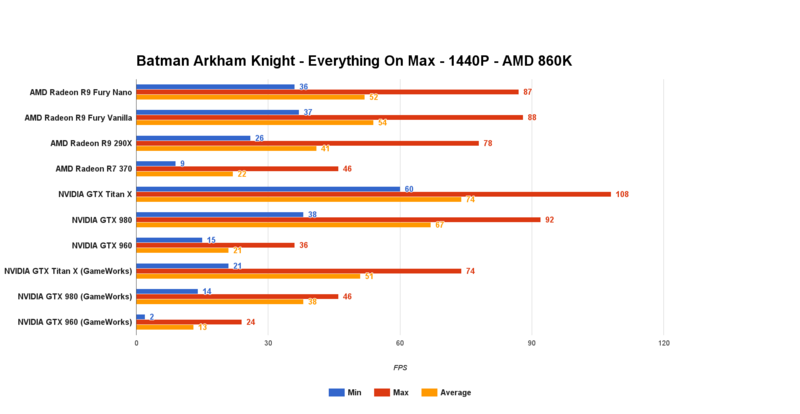 Despite the prevalent complaints about the performance being poor, Batman Arkham Knight ran rather smooth during all benchmarks. Even the lower-end cards had little stuttering and smooth gameplay despite the lower framerate. I did encounter issues where it would crash to the desktop if I left the benchmark results on the screen for too long. No other issues were encountered on either the AMD or Intel system during actual play or the benchmarks. Now the issue of the Enhanced settings that are available for both AMD and NVIDIA cards. There is a distinct difference in how these are handled by each GPU, so it will affect NVIDIA and AMD differently, so this is not apples vs apples in this case. 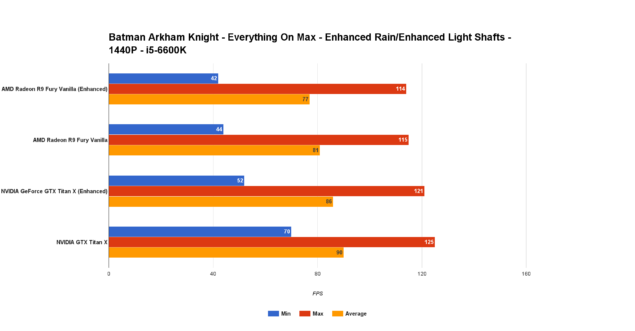 Enhanced Rain uses PhysX which uses CUDA on NVIDIA cards and runs on the CPU for all else. This means there will most definitely be a performance deficit for using it on NVIDIA hardware. 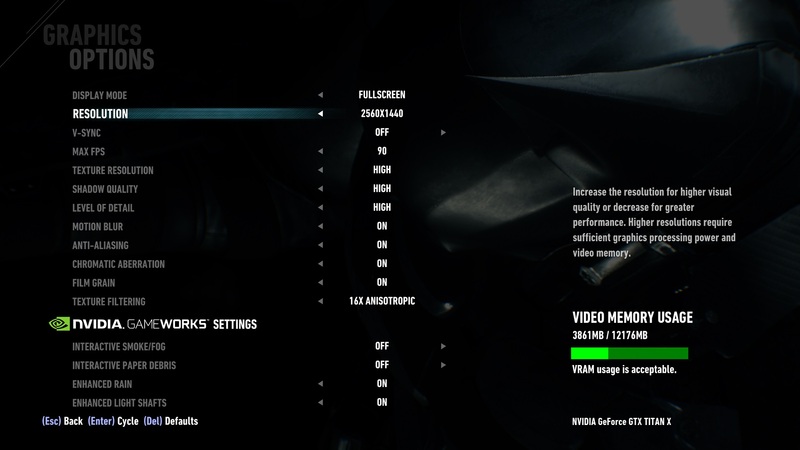 The following settings were used for both the Fury and the Titan X, with 1080P and 1440P being the resolutions being tested. 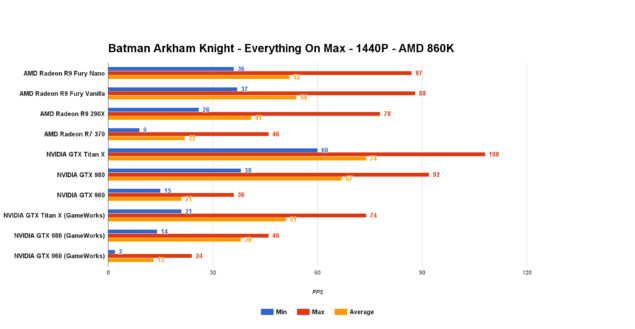 As is expected, enabling the two for AMD has very little performance impact with a good enough CPU. The difference in performance is very small and the Fury instead offloads the PhysX portion to the CPU. Enhanced Light Shafts doesn’t seem to be very intensive an effect here. For NVIDIA, just as we predicted, the performance impact is a bit greater because of having to divvy up the SMX’s to two queues in a not so efficient way. I’m curious as to if the slower context switching has an effect on asynchronous compute in DX11 using their own internal method of doing it. Certainly mashing the two together can have an impact when the effects complexity and quality are increased, rather than simply offloaded for performance reasons as it’s being done in the latest DX12 demos. What can we make of the performance? 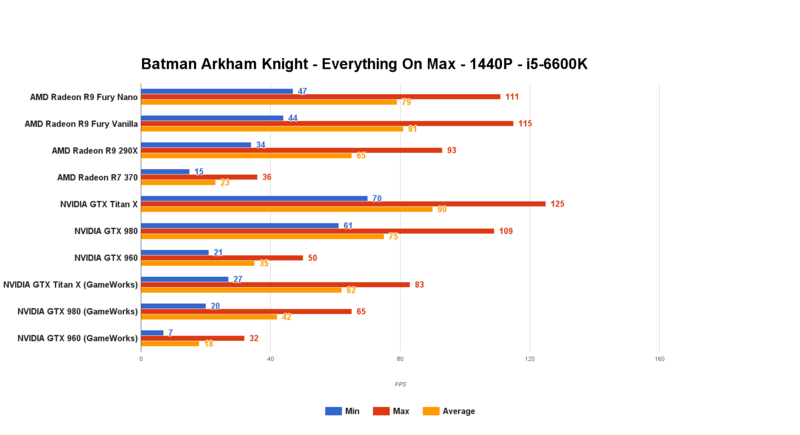 The results on their own show that Batman Arkham Knight is a good performer on its own. It plays smoothly and without many issues that are truly game breaking. GameWorks obviously has an effect, and the underlying code could have been the root cause for other game-breaking bugs. But for some, those effects may not look good at all. The smoke doesn’t really look realistic, and only the enhanced rain and PhysX really look spectacular and are worth it. And in this instance, and in all GameWorks titles thus far, there’s going to be a performance decrease as a result, that’s just the reality of doing so much in the queue at one time. You’re adding work, a lot of it, but the results might not be for everyone. Now someone needs to make a middleware that can use OpenCL to compute the same effects in GameWorks and make it open source. This way DX12 can easily make use of it with asynchronous compute for all GPU’s. Does it compare to the initial release? It’s faster, certainly, and GameWorks even runs smooth, despite the decrease in actual FPS. While the work that Rocksteady has done to improve performance is obviously not groundbreaking, it has been increased perceptibly. Bugs and any crashes you might encounter are going to differ due to a lot of different factors. I personally had no issue playing it, but that doesn’t mean that a large number of people share the luck I had. So your mileage may vary, and if reports are true, it’s still very iffy at best.